The villagers of Bil’in, central West Bank, along with international and Israeli supporters protest the Israeli-built wall on villager’s lands. The Israeli army, this week, announced the villages of Bil’in and N’ilin, central West Bank, are closed military zones every Friday for six months. The order forbids Israelis and international supporters from getting inside the villages on Friday or they will face arrests and deportation. The village of Bil’in has been staging these Friday Protests since 2005. 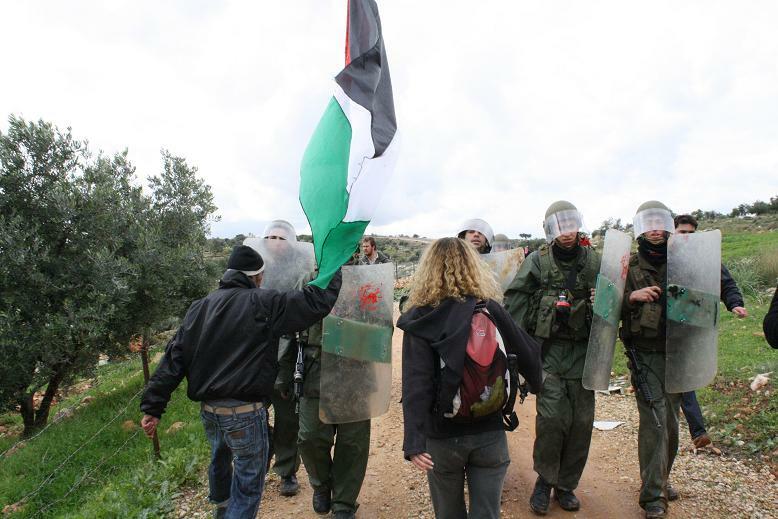 As has been the case since the inception of the protest, villagers today were joined by Israeli and international supporters and marched, after the midday prayers, towards the lands Israeli took to build the wall. As soon as the protesters reached the gate of the wall, that separates farmers from their lands, troops stationed there fired tear gas and rubber coated steel bullets at them. Local youths managed to remove part of the wall before tear gas and sound bombs forced them back. Dozens were treated for the effects of tear gas inhalation. The Israeli court ordered the army to remove the wall built on Bil’in’s lands two year ago. The army started to reroute the section of the wall there only one month ago.